At long last the doctors have released me from the majority of the restrictions I have been living with since my bypass surgery in late July. Thank you again for all your kind words, thoughts and prayers. They were and are greatly appreciated. I am feeling great and able to work pretty much full time now, although I do get a little tired in the afternoons. It’s a great excuse to head home from the office early. 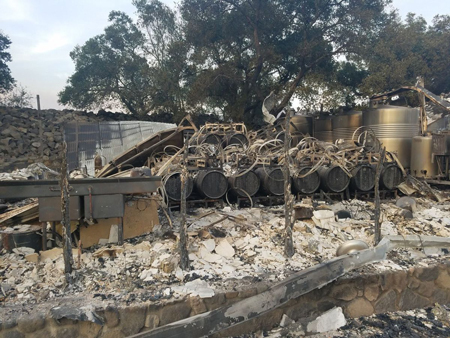 The recent wildfires destroyed many wineries including the Sill Family Vineyards in the Atlas Peak area of Napa. A number of you have called or emailed about our wine operation in Napa. We are fortunate that our wine inventory is stored in a warehouse south of Napa, a good distance from any of the fires. Our office in American Canyon is presently at no risk. The fires started October 8, 2017. The number of different fires reported may have been as many as 25. As of last count there were 41 people confirmed dead as a result of these fires. There are still hundreds of people missing or unaccounted for. 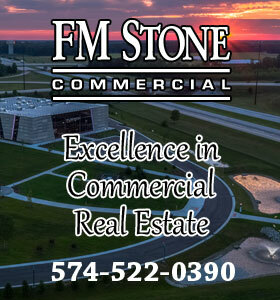 An estimated 6,500 homes and commercial buildings have been destroyed in the fires. The current estimate is said to be 225,000 acres that have been burned and more than 100,000 people have had to be evacuated from fire zones. There are a lot of unclear items such as how the fires started, how many people have been injured and how many structures have been lost or damaged. The cost of this fire may take years to determine. Our winemaking team, Sean Larkin and Bruce Devlin, in St. Helena and Yountville are safe and doing fine. Sean did have trouble finding a bar with a generator when the City of Yountville lost all of its power. My friend Roy D. Chapin IV and his mother, Jane, owners of 4 Winds Winery in the Stag Leap District did have a very close call. The fire took one of their buildings, a guest house where Roy lived. The main house and garage were spared. I am pleased to report that Roy and Jane are safe and grateful for the assistance they received. The California wildfires destroyed the homes of winemaker Kent Humphrey and his assistant Hanna Chort. This photo is what is left of Hanna’s home. Our winemaking team in Santa Rosa was not as fortunate. Kent Humphrey, our winemaker for our Glenwood Cellars Chardonnay, Sauvignon Blanc and Pinot Noir, lost his house, vehicles and all personal effects. He and his family were not injured and are safe. 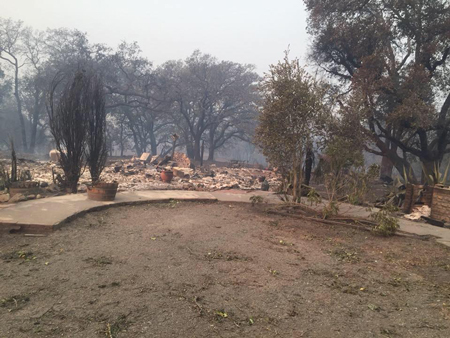 Kent’s assistant winemaker, Hanna Chort, and her fiancé, Chris Hollingsworth, lost their home as well. They were able to save their two cats but nothing else. They evacuated their home and went to a friend’s house, which it turned out was also in the fire’s path and they had to evacuate there as well. Please keep all of these people and the other fire victims in your thoughts and prayers. Over the past weeks of my surgery recovery period I have peddled and walked a lot of miles on my home exercise equipment. During those miles I have read many magazines, the majority of which (naturally) had to do with wine. One of the interesting things I noticed was the number of articles pertaining to food and wine pairings. In fact I Googled food and wine pairings and found there were almost 23 MILLION results. It would take a lifetime to read them all. 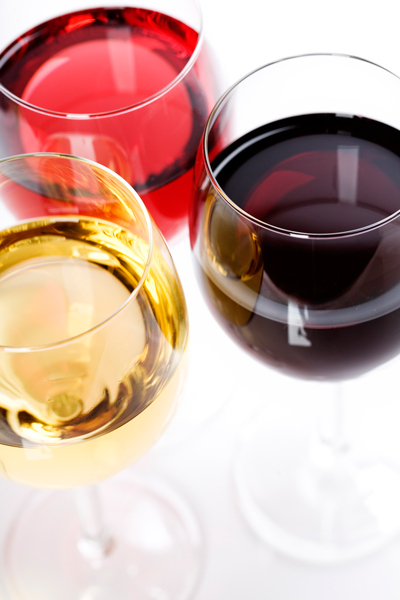 Drink what you like: be it red, white or rosé! 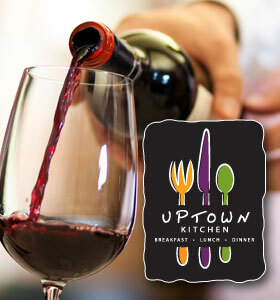 Why do I mention wine and food pairings? It seems to me over the years that the need to pair certain wines with certain foods has increased, maybe to the point of being out of control. In fact, I have written several articles on pairing which have appeared in my blog. In these articles I have repeated the long-standing rules of white wine is to be paired with white meat, fish, seafood and salads; or red wine with red meat and so on. As I thought of pairing wine in general I remembered when I started drinking wine some 20 plus years ago. At the time I only drank white wine. In fact, my favorite was Chablis. Typically Chablis are dry, aromatic and unoaked. It was about the only wine I drank and I had it with every type of food. Now it is just the opposite – I want the biggest, meatiest, tannic, full-bodied red wine I can get. My motto: The dryer the better. Although these types of reds are my preference, I also very much enjoy experimenting with white wines such as Viogniers, Semillons, Rieslings and various white blends. My question is how necessary is it to pair food and wine? Do you really need a different wine with each course? Now, don’t get me wrong, I enjoy pairing wine with food and do it all the time at the various wine dinners I sponsor. I love drinking multiple wines with a meal. 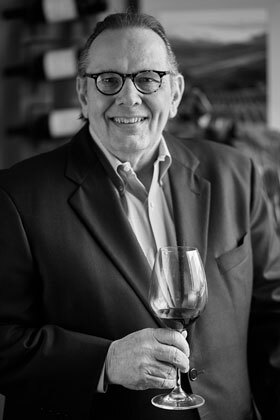 As I become more experienced in the world of wine, just as all of you are after years of trying different wines, I believe that in a lot of situations I personally am leaning towards “it’s more interesting and at times preferable to have one bottle or type of wine with a meal” rather than always pairing food and wine. Perhaps our goal should be to look for wines and food that don’t conflict. You don’t want the food or wine to overwhelm the other. We have all had wines that tasted so good we didn’t care as much about how the food tasted. In that case I could, and believe you could as well, drink that wine with any and all food courses being served. Some wines are at their best when paired or married to food. In that case pairings are important. Let me suggest going forward we all pay less attention to how the wine is paired. With more attention given to the wines we like best. Or even make our wine selections based on the people we are with, why we are together and perhaps the season. 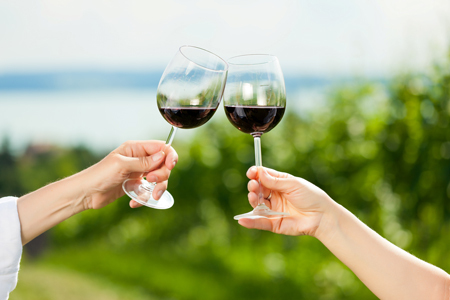 Wine always tastes better to me when I am sharing it with friends. Great article and I am happy that you are doing great on your recovery. I would have stopped yesterday if I didn’t have a cold. Hi Donna. Hope you and Glen had a great trip. Sorry you guys are not feeling well. We hope to catch up with you soon. Thank you Carl, I agree that wine tastes better when enjoyed with friends. Hi Shawn. Hope you guys had a great trip to the West Coast. We need to arrange dinner so this time I can have a glass with the two of you! !